In this recent view of the Arecibo Observatory in Puerto Rico, the 96-foot line-feed antenna that once dangled above the telescope dish is still missing. It broke off during Hurricane Maria and punctured the dish below. Puerto Rico's Arecibo Observatory, the second largest radio telescope in the world, celebrates the 55th anniversary of its grand opening today (Nov. 1). Since it began operations in 1963, the telescope has scanned the skies for signs of extraterrestrial intelligence and potentially dangerous near-Earth asteroids. It even made a cameo in the James Bond movie "GoldenEye." Hurricane Maria made landfall in Puerto Rico as a Category 4 storm on Sept. 20, 2017. The storm destroyed much of the island and inflicted damages on the radio telescope's 1,000-foot (305 meters) dish. A large line-feed antenna that hung high above the dish broke off completely. While science operations resumed shortly after the hurricane, it will take another four years to complete the $14.3 million repair job, Francisco Córdova, the director of the observatory, told Space.com in an email. "We have performed most of the immediate repairs needed to sustain operations," Córdova said. "These include debris-cleanup activities, repair of the primary reflector panels damaged/punctured during the hurricane, inspection and cleaning of the rim wall surrounding the primary reflector," and repairing damages to other buildings at the observatory, he said. Meanwhile, the observatory is also being fortified to prepare for any additional catastrophic storms that could hit Puerto Rico in the future. "That being said, there is still a lot to be done, in particular for more-complex scientific equipment," he said. One of the big repairs still pending is the replacement of the big line feed that broke off during the hurricane. Although the 96-foot (29 m) antenna might have looked like one of the most important components of the radio telescope because of its size, but losing it hasn't affected the observatory's science capabilities too much. "By losing the line feed, we lost our ability to perform dual-beam 430-MHz atmospheric radar observations," Córdova said. However, there's another 430-MHz radar feed inside the dome that is suspended above the dish, "so we have been able to maintain a similar capability," he said. Another priority will be to fix the alignment of the telescope's primary reflector, or the enormous main dish that was damaged during Hurricane Maria when the line-feed antenna fell on it. First, scientists are working on coming up with a new kind of technology to accomplish that task more efficiently. "In the past, photogrammetry was used for this, but the process was very manual- and labor-intensive, taking over six months just to collect the data," Córdova said. "We are exploring a laser technology that could provide a real-time model of the dish in less than 3 hours." After the team maps the surface of the dish, adjusting the alignment should take less than six months. The aging Arecibo Observatory, which has received most of its funding from the U.S. National Science Foundation (NSF) since the 1970s, has been on the chopping block for more than a decade. In February, the NSF announced that it would cut its annual contributions to the observatory by more than 25 percent and that the University of Central Florida (UCF) would take over management of the observatory. Some researchers who use Arecibo Observatory voiced their concerns over the ongoing funding uncertainties during a town hall event at the 50th annual meeting of the American Astronomical Society's Division for Planetary Sciences in Knoxville, Tennessee, on Oct. 24. "The National Science Foundation has been very generous with the repairs," Yan Fernandez, a principal scientist at UCF, said in the town hall. But now, "the task for UCF is to figure out how to replace that money" that NSF was contributing annually. NASA is increasingly providing funding for radar astronomy observations at Arecibo, which helps, but it's not enough to make up for the deficit. NSF will gradually reduce its funding over the next five years, giving the observatory time to find additional outside donors and partners who can "buy into the observatory," Fernandez said. While scientists were thrilled to learn that NSF would not shut down the observatory in the expensive aftermath of hurricane Maria, some researchers now worry that the financial burden may fall on their respective research institutions. Researchers may have to pay fees of more than $2 million for each use of the telescope. This whopper of a price shocked a few scientists at the town hall. However, others pointed out that the funding NSF is taking away from Arecibo Observatory could be awarded to scientists as research grants instead and that other donors may be interested in funding specific research projects. Fernandez suggested that another way to help Arecibo Observatory astronomers fund their work would be to make the observatory a part of UCF, which is now only managing the facility. If the university owned the observatory, it could get funding from the state of Florida, he said. 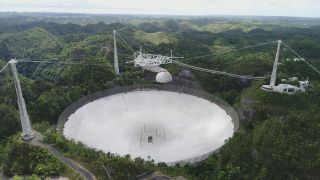 An aerial view of the Arecibo Observatory in Puerto Rico following the cleanup of Hurricane Maria. The 1,000-foot (305 meters) dish was cleaned for the first time in history after the hurricane. While repairs are underway, the observatory will get some big upgrades, too. In August, UCF announced that the Arecibo Observatory will soon receive a new supersensitive antenna called ALPACA (Advanced Cryogenic L-Band Phased Array Camera for Arecibo). Now, the observatory staff are working on a second proposal to submit to NSF for another round of repairs. That proposal will be submitted in early 2019, Córdova said. Some big projects that observatory staff are considering for the new repair proposal include "major upgrades to telescope control and transmitter systems" and "infrastructure improvements for better maintenance of critical equipment," he said. The observatory may also soon get a new supporting cable to replace one that was damaged during an earthquake in 2014. "While it does not pose an immediate risk to the structure, we would like to see that cable completely replaced," Córdova said. With all of these upgrades and repairs, "our intent is to maximize resiliency while increasing scientific capability" of the Arecibo Observatory, Córdova said. The NSF, which is paying for most of the repairs using disaster-relief money awarded by Congress, will review the observatory's new proposal and allocate funds to the various projects sometime in 2019.